Personalized URLs, also known as PURLs, are a highly effective form of marketing for your mortgage business. When used with a state-of-the-art mortgage CRM, they can help you not only add a personalized touch to your campaigns, but also generate leads. You may have heard that PURLs are great for increasing response rates, but the reality is the primary goal of any PURL campaign is to identify visitors to your website and then continue to engage with them until they convert. Simple to use and easy to customize, PURLs can be made up of text, images, video, response forms, and audio, all targeted to the viewer’s personal needs or interests. Mortgage lending mailings have plenty to gain from using an individualized marketing approach. Using the power of the data collected by your mortgage CRM, you can create compelling interactive experiences for website visitors. Mortgage mailings you send out direct each recipient to his or her own unique landing page. Once they arrive at that page, they discover a personalized site that speaks to their specific needs. Current or past customers can then take surveys and potential leads can answer questions or request more information. How does this help you capture more leads? Without a PURL, the person who received your postcard or mailing and then visited your website remains anonymous. With a PURL, you can track exactly who is visiting your site. Being able to personally identify a visitor led to your site by a piece of offline marketing is extremely valuable to your marketing goals. 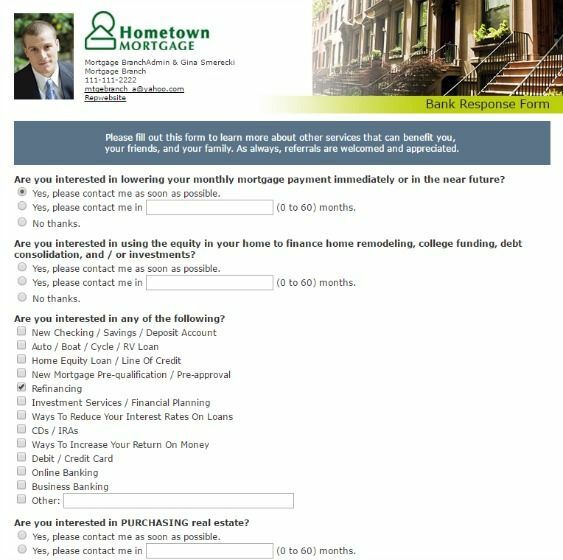 Everyone appreciates the personal touch, and using PURLs in your mortgage CRM-generated mailing campaigns is the perfect way to make a positive impression on your audience. A mailing that highlights their own personal website increases the odds they’ll go online to check it out. This makes PURLs powerful tools for developing and refining your database and boosting future ROI.